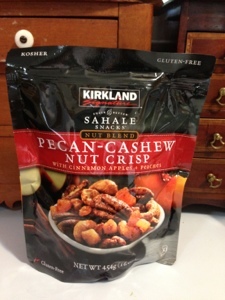 If you haven't tried Sahale snacks, they're great - a mixture of sweet and savory. Costco started carrying these in the last few years; but, even at Costco, they were expensive. Now, Costco has a newly developed Kirkland Sahale mixture, more reasonably priced - $9.99 for 16 ounces. This new pecan, cashew, apple, peach blend has the sweet and savory taste characteristic of the brand. I've always eaten these as snacks, but the package suggests sprinkling on salads, which I agree would be perfect.